Each and every one of us has that one perfect dream that keeps you going, even when times get pretty tough. These days, it seems that more people have a perfect dream of becoming fit, but instead of reaching the goal most of the times, they simply drift away from it. What is the reason, you may wonder? The thing is that there is a lot of things that depend on the person, but there are common mistakes, which people, especially the beginners, make. First and foremost, reason why you do not reach any result is that you do not follow a plan that suits you perfectly. Since before simply jumping to best workout plan you found on the web, it is important to carry out a research on what is that you need, not what most people do. Secondly, if you exercise once a month, there is barely any possibility you will reach your goal anytime soon. Success requires devotion. Of course, you may say that with the lack of spare time it is close to impossible to find some to devote to your workout. Here is where you are wrong. 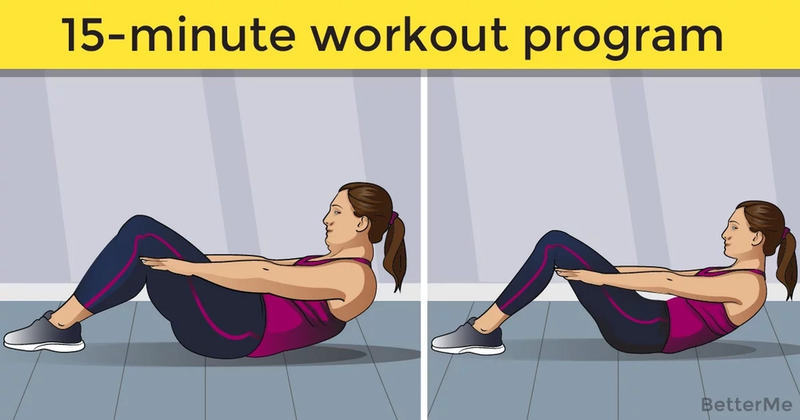 We happen to know a nice 15-minute set of exercises, which will not only get you that 6-pack set in no time, but also will suit all people who want to make their dream come true. Last but not least, getting fit is a complex process, that is why apart from workout there is a need for healthy diet to be involved. If you have 15 minutes daily at your disposal, and ready to switch from a burger to a salad – then what are you waiting for? Make your dream come true! #2. Kneeling Oblique Crunch with Fitness Ball.